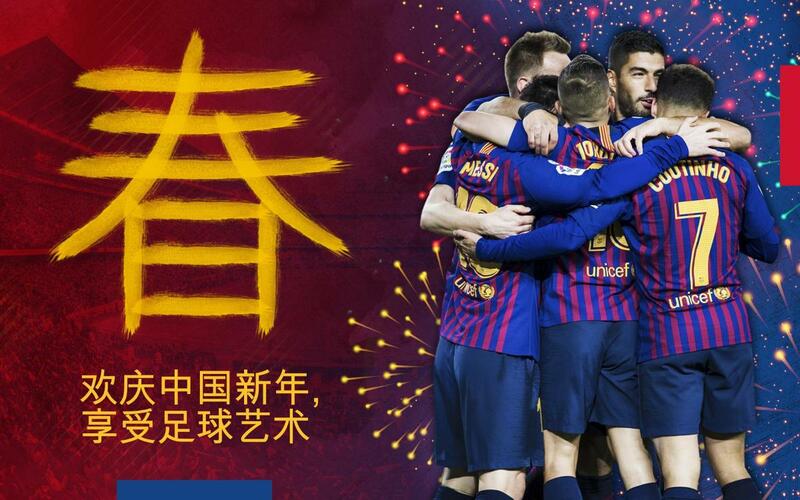 FC Barcelona are celebrating Chinese New Year, also known as the Spring Festival, the most important festival on the Chinese calendar. 2019, the Year Of The Pig, is an important year for Barça’s strategy in Asia, which will see the first team visit China and Japan for a pre-season Summer Tour. In their Chinese New Year message, FC Barcelona highlight the motto of 'Mes que un Club' with the participation of four players from the first team: Leo Messi, Gerard Piqué, Marc-André ter Stegen and Samuel Umtiti, as well as Kheira Hamraoui, of the Barça Women team, a youth player and a Chinese child from the Barça Academy. The objective of the video, besides congratulating all Chinese fans, is to emphasixe Barça's style of play, with the art of a way of playing football that has been driven by passing. From Ter Stegen to Messi, the movement of the ball sketches the Chinese symbol 春.
FC Barcelona have maintained a close sporting, social and economic relationship with China for a long time. In September 2013, Barça opened their first permanent office abroad in Hong Kong. to attract new sponsors and to work in the Asia Pacific market, but above all to create a long-lasting connection with the fans. Asia is a continent where Barça have more fans than in Europe and America combined. China is one of nine strategic countries for FC Barcelona, ​​together with the United States, Mexico, Brazil, Japan, India, Indonesia, Turkey and, of course, Spain. The work carried out in recent years has led to the creation of a solid community of followers in China. Studies show that FC Barcelona have great acceptance among Chinese sports fans. Barça are the best-known sports team in China (56%) ahead of Premier League teams and sides from the NBA and the NFL. In these studies it is shown that the typical Barça fan in China is mostly male, young and with a high level of education indexes. Barça want to contribute to the development of football in the country, and the strategy to increase the interest of Chinese fans for the sport and also for the Club means bringing the authentic Barça experience to China. It involves explaining to our uniqueness, what we do differently to other teams and why we are ‘More than a Club.’ We want to adapt our message to our Chinese fans, but continue to be faithful to the values ​​and principles on which Barça was founded in 1899. 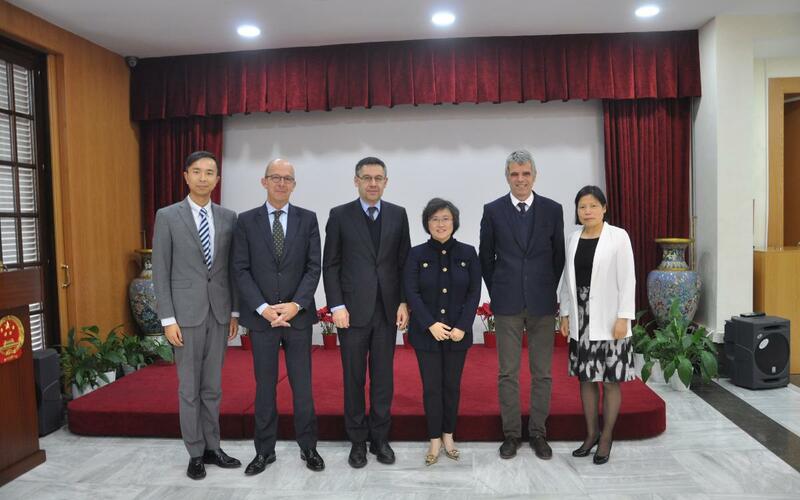 The president Josep Maria Bartomeu, the second vice president of the board Jordi Cardoner and the director Jordi Calsamiglia, with the Chinese consul, Lin Nan, and other members of the Chinese consulate. To achieve this goal, work is being done to increase understanding of the local needs of Chinese fans, adapt the Club's message and create specific local content from China itself. Currently, Barça have many projects that reflect the Club's desire to establish roots in the country and show that the presence in China is long-term. A good example of this is the fact that Barça are is the first club to invest directly in the country with the implementation of a Joint Venture with Mission Hills, a 360 degree project in Haikou, the capital of Hainan Island, which will include an area for Barça experiences with an interactive museum, a store and a restaurant, as well as a Barça Academy Pro -one of only two in the world, together with that in New York. In addition to this Barça Academy Pro in Haikou, with 117 boys and girls, the Club have another five academies, located in Chengdu (427 players), Qingdao (232 players), Lijiang (opened January 2019), Kunming (90 players) and Fuxian Lake (to be opened in 2021). The Club have three official Supporters Groups in China: Shanghai, with 162 members; Beijing (111 members) and Hong Kong, which is the largest with 380 members. On official social networks, Barça have 6 million supporters on Weibo, 60,000 on WeChat and nearly 130,000 on Douyin and Toutiao, two recently-opened channels. The first of these is an entertainment site for young people with short videos. In its first week, Douyin and Toutiao, which are part of the ByteDance platform, achieved more than 200,000 interactions and a total of 4 million video reproductions. Barça's interest in China has also resulted in the interest of big brands. Among the 49 partners that the Club have, six of these are Chinese brands (Oppo, Head & Shoulders, Safeguard, Shimao, SPD Bank and Yunnan Baiyao. In addition, Barça also have projects in the fields of innovation and knowledge through the Barça Universitas platform in the Barça Innovation Hub and the Guanghua School of Management at the University of Beijing, to develop joint university activities and sports management models. Barça's projects in China and the Summer Tour were the subject of a recent visit to the Consulate of the People's Republic of China by a delegation from the Club, headed by president Josep Maria Bartomeu, first vice president Jordi Cardoner and director Jordi Calsamiglia. During the meeting with the general councillor, Lin Nan, the Club’s ties with China, such as the Barça Experience project opened in Haikou with Mission Hills, the Barça Academy and the Summer Tour, were discussed. President Bartomeu delivered an invitation addressed to the President of the People's Republic of China, Xi Jinping, to visit the Barça team during their visit to the country this summer.